Watts Series 3/8 SD3-MF, SD3-LS-MFxMF is a dual check with atmospheric port designed for the protection of the water supply from carbondioxide gas and carbonated water. These substances can flow from post-mix beverage systems and are very acidic. If the acidic water comes incontact with copper tubing or copper pipe, it will cause the leaching of copper salts into the water supply. The dissolved copper if ingested can cause nausea, abdominal pain, and in some cases vomiting. The Watts Series 3/8 SD3-MF, SD3-LS-MFxMF prevents the reverse flow of potentially contaminated water into the potable water supply. The Watts Series 3/8 SD3-MF, SD3-LS-MFxMF atmospheric vent provides a visual indication of failure in the event that the downstream check fails and system back-pressure exceeds the supply pressure. Watts Series 3/8 SD3-MF, SD3-LS-MFxMF is recommended for use on Post-Mix Carbonated Beverage Equipment and equipment for tea and coffee. Before installing, flush out pipe lines to remove scale and other foreign matter. The valve can be installed horizontally or vertically (flow up or down). Install the valve in the line with the arrow on the valve body pointing in the direction of flow. 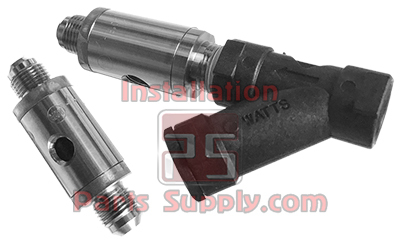 Connect a vent discharge line to the vent outlet of the Watts Series 3/8 SD3-MF, SD3-LS-MFxMF and vent to a safe place of disposal with adequate ventilation. The valve should be installed such that the strainer and the valve are accessible for service and maintenance.